There’s no denying that the CG family comedy is nowhere near as novel as it once was. For all its strengths, the mix of in-jokes, eye-catching visuals and crossover appeal just doesn’t have the same surprise element it did back in the heyday of Toy Story. But while audiences may come to tire of the genre eventually, the success of Shark Tale in the States (likely to be repeated in the UK) suggests that day is some way off yet – just as well with The Incredibles, Robots and Madagascar all on the imminent horizon. To be honest, Shark Tale – DreamWorks’ first foray into the territory – is one of the weaker efforts, especially when compared to its aquatic forerunner Finding Nemo. Still, it remains an enjoyable crowd-pleaser with its fair share of laughs and memorable scenes. The plot is basically an underwater mob comedy. Bottom-feeding wrasse Oscar (Smith) works down at the ‘Whale Wash’, scrubbing down whale-tongues while daydreaming of becoming rich and famous. So when an anchor kills one of the Great Whites terrorizing his city Oscar happily takes the credit. Dubbed ‘The Shark Slayer’ he revels in his newfound popularity – but it’s only a matter of time before the dead shark’s father, the feared Don Lino (De Niro), catches up with the apparent killer. Oscar teams up with the Don’s runaway son – a placid vegetarian shark named Lenny (Black) – to save the city and get pa to accept Lenny for what he really is. Shark Tale feels a slightly cynical exercise occasionally, with blatant advertising thinly disguised by poor puns (‘Coral-Cola’ anyone?) and the recurring presence of the dreadful Carwash cover by Christina Aguilera and Missy Elliot not even bothering to change the lyric to ‘Whale Wash’ (because, well, what 12 year old girl is going to buy a single called ‘Whale Wash’?). It lacks the innocent charm and memorable characters of Finding Nemo (Oscar’s mugging swiftly becomes more grating than endearing) and is often too content to coast on obvious jokes and predictable plotting. However, Shark Tale is more like a grown up comedy than Finding Nemo, and perhaps it’s better to see it as an animated sitcom rather than a ‘family’ film. After all there can’t be many young kids likely to get the string of gangster movie references, digs at pop culture or the gay subtext (Lenny bemoans how he’s not like other sharks). Not to say we’re in X-rated Fritz the Cat territory – the film still ends in good old-fashioned manly hugs (or should that be, uh, fishy hugs?) 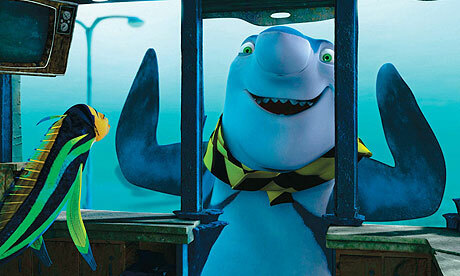 – but Shark Tale does feel like a movie for adults that children will also enjoy rather than the other way round. Weaker effort or not, there are enough hilarious moments here (shrimp attack and Lenny dressed as a camp dolphin being two highlights) to counter the jokes that fall flat; and of course the computer-generated waterscapes are as detailed and stunning as you’d expect. Plus you get the unique sight of Martin Scorcese as a puffer fish (complete with Marty’s famous eyebrows), surely a first in the great man’s career.